Today I’m thinking about my brand spankin’ new, never been used, Kitchen Aid stand mixer packed away in its box and sitting in storage in my brother’s house. If you’re a regular reader of this blog, you know I love to bake, and I had been wanting one of these bad boys for awhile. And in December my mom surprised me with one! Unfortunately with all the busyness I never got to use it before I moved to Calgary. And it didn’t make the trip with me as I don’t have my own place here. 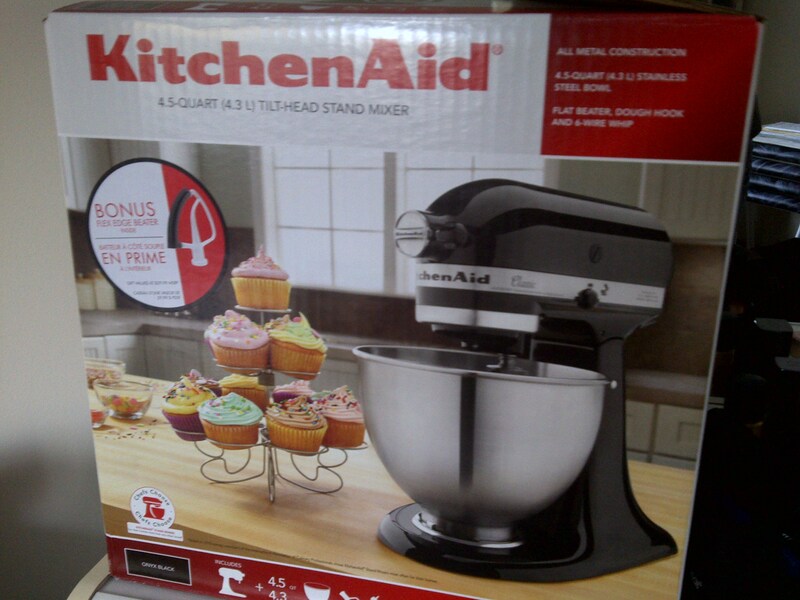 So today I can’t help but think about how much I’d like to whip up something tasty with my new mixer! I got 1 for v-day! I whipped everything I could find! Sorry! I finally took the plunge and bought myself a KitchenAid about a year ago (I had been looking forever and it was on super sale) and I LOVE it. Best money I have spent in the kitchen! When you do get your own place and/or the chance to use it you will LOVE it too! you’ll love it!! I got a pretty red one for Christmas a few years back… the problem is we like to eat the great results… resulting in a few unwanted jiggles!! ENJOY! !